Maybe its not for everyone, but how to make jewellery using your small gold nuggets is relatively simple. 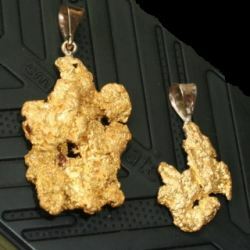 ....And it will add massive value to your small nugget - many times its value as a natural gold nugget. Whether you want to sell the gold jewellery you make or just sell your gold nuggets, you will be able to make unique and stunning gold nugget jewellery for your own use. The reality is that the beauty of a gold nugget is really in the eyes of the beholder. Just like the video on the "Gold Cleaning" page Gold Specimens and Nuggets Video where it is explained some people like to acid all the impure (non-gold) material out of a gold and quartz or ironstone specimen, others prefer just to leave the specimen as it is as a collector's piece. 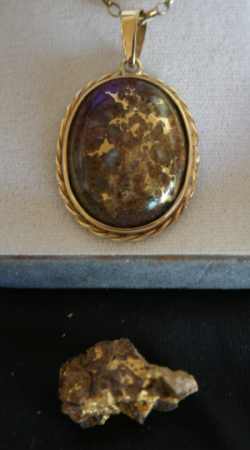 Remember too, that natural gold nuggets and beautiful gold nugget specimens are quite rare. Rarer than Diamonds as a matter of fact. The larger the nugget the more rare it is. You will be paid a premium for a natural gold nuggets, see the sell your gold nuggets page, particularly Western Australian Gold Nuggets which are of a very high purity and Crystalline Gold. Sometimes that value or price that you receive will also be influenced by the interesting shape of the gold nugget or on the other side of of the equation whether the nugget is just an ugly lump. This will also influence your decision on whether you use your small gold nuggets for jewellery pieces or not. ....Like we mentioned earlier, the beauty or ugliness of a gold nugget as a jewellery piece is really in the eyes of the beholder. Udo Soldered this bail to an attractive nugget to make an awesome pendant. This page will tell you how to clean your gold nuggets to the level you want them for your Jewellery Making. Please review this page thoroughly again because there are some important SAFETY MEASURES you need to take when cleaning gold - particularly if you use acids! Using clear jewellery earrings and pendant cases to insert your small gold nuggets. Using Bails, ear posts, ear hooks and soldering your gold nugget to the gold fittings. How to make jewellery with gold nuggets using the clear pendant or earring case jewellery fittings is simple. You just need to clean and polish your small nuggets and insert them into the fittings by undoing a holding screw in the fittings, inserting the small gold nuggets and then tightening the screw to complete the jewellery piece. It looks quite stunning and is an easy way to showcase those small nuggets you have found with the new Minelab 5000's. This is a little more complex and requires some skills and knowledge of soldering gold using basic equipment that mostly you can source from your local hardware store. Gold Solder, Gold Soldering Flux and the gold jewellery parts can be sourced online. 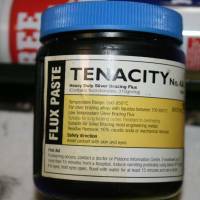 Much of the equipment you need can be sourced from hobby shops or hardware stores, there is no real need to go and and buy sophisticated, expensive gear! Gold Solder (wire is easiest). Or..Combined Gold Solder and Gold Flux. The required Bails, Rings, Ear Posts, Findings, ear hooks that you wish to use. Gold Pickle to remove the scale after soldering. 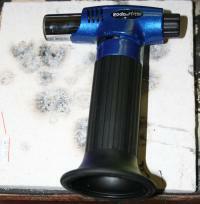 A Gas torch like this and heatproof tile. 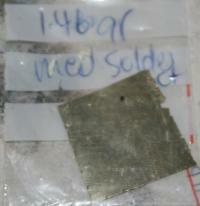 Gold Solder Sheet but Gold Solder Wire is easier - you buy by the weight and purity of the gold solder. Handy Gold Solder and Flux combined in a syringe. We like to support Australian products so we have included this on our site - Jim is also a regular contributor to the Australian Gold Gem and Treasure magazine so he knows his stuff. He has also produced the video in his backyard shed, it's not sophisticated, but he shows you the simple and effective way to solder your own gold jewellery. He also shows you how to polish your jewellery. Not only are the techniques covered but also sources of jewellery tools and equipment as well. 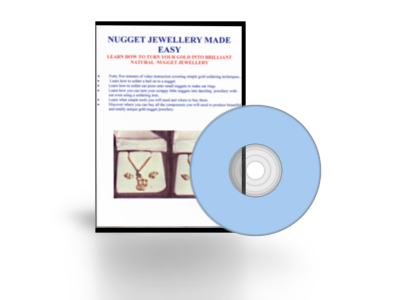 The NUGGET JEWELLERY MADE EASY is in DVD format which can be played on your television DVD/CD player as well as on your computer. The DVD contains 45 minutes of video instruction on how to make jewellery covering simple gold soldering techniques that you can use to make stunning pendants and earrings. For only , $33.00, it's a cheap way to learn how to add massive value to those small gold nuggets that you found - email Jim Foster at jfoster1944@bigpond.com or phone him on 0409285556 and he will provide you with your own copy. Return to Gold Prospecting home Page from "How to Make Jewellery" page.